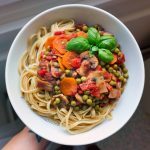 This is my first recipe post from Belgrade, Serbia! We’ve been here just over a week now and I feel like we’ve adjusted nicely to our new living space. The kitchen here is smaller than our kitchen in Zagreb so I had to figure out a new routine when it comes to cooking our favourite meals. We don’t have an oven anymore and won’t have one until we reach Poland in April. Sadly, that means no more oatmeal cookies for a few months. If you’d like to see what our flat looks like here in Belgrade, check out my flat tour video. At any rate, we’re still able to cook pasta, boil potatoes, and steam veggies. We have plenty to work with so I’m not complaining. I’ve made chili several times in the past week because it’s cheap, easy to make, filling, and delicious. All you need is fresh, frozen, or canned vegetables, diced tomatoes (or even a pre-made tomato sauce), your favourite seasonings and a lemon. My chili isn’t a true chili since I don’t use any chili powder, but it still tastes like the real thing to me. Feel free to add chili powder, cayenne pepper, or hot sauce if you want it spicy. My stomach can’t handle anything spicy lately (even sweet paprika doesn’t agree with me for some reason) so I prefer this mild version instead. While you don’t need chili powder in this recipe, fresh lemon juice is essential. It’s hard to explain without you tasting it right here in my kitchen, but fresh lemon juice brightens the sauce and adds another flavour dimension. It balances the rich tomato base, bringing the sauce to a completely different level. It’s just tasty. Do a taste test before and after you add lemon juice and let me know what you think! 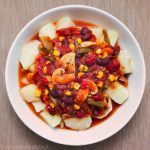 We like chili with boiled potatoes but it’s also delicious on top of baked chips, rice, and even pasta. We can buy potatoes at the market for cheap and they’re easy to prepare (thanks to Kuba doing all the prep! ), so boiled potatoes are one of our favourite starches at the moment. Simply peel and cut potatoes into smaller pieces and place them in a pot with enough cold water to cover them. Bring it to a boil and cook potatoes for around 20 minutes or until the potatoes are soft when poked with a fork. Easy! And to add some green to our bowls, we serve it with steamed broccoli on the side. This is one nourishing plant-based meal! Place the basket inside a medium to large pot, fill the pot with enough water so it barely reaches the bottom of the basket, place broccoli florets inside and cover. Bring the water to a boil, reduce the heat slightly, and let it simmer for 15-20 minutes or until the broccoli just starts to soften. The steam from the simmering water gently cooks the broccoli for tender, almost-buttery broccoli florets every time. Heat a large saute pan (or a large pot) over medium-high heat. Add the water, mushrooms, bay leaf and seasonings. Stir well and saute for 5 minutes or until mushrooms shrink and release water. Stir in tomato paste, diced tomatoes, and veggies. Bring to a boil and simmer for 10-15 minutes stirring occasionally (so the liquid reduces and the sauce thickens). Lower the heat slightly if the sauce starts to stick to the bottom and stir more often. Remove from heat, let cool slightly, and stir in the juice from half a lemon. Serve with potatoes, rice, pasta, or your favourite starch! Use any mix of fresh or frozen veggies. 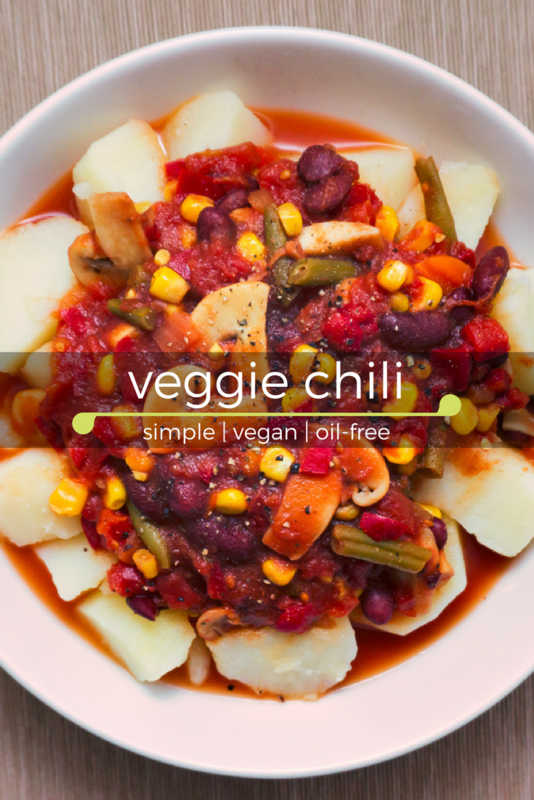 We tend to use a small bag of frozen veggies because it's easier for us. 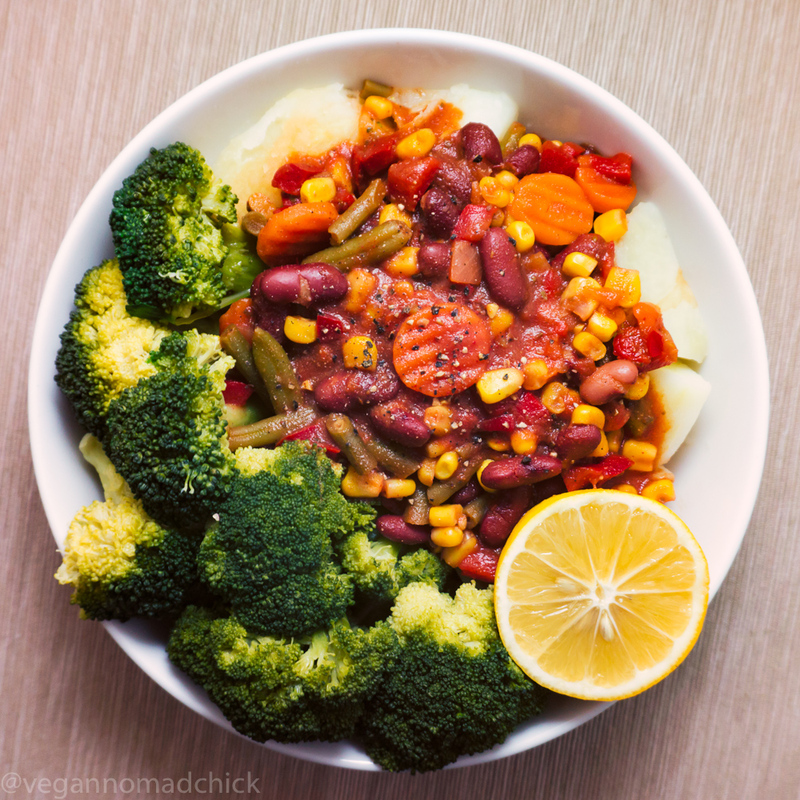 Our favourite frozen mix right now contains kidney beans (1 cup), chopped corn (1 cup), green beans (1/2 cup), diced carrots (1/4 cup), diced peppers (1/4 cup), and diced onion (1/4 cup). Canned peas, corn, or beans are nice to use as well. If you're using canned peas, add them in at the end of cooking so they don't fall apart.